Now that all the filing and shaping is behind me progress is back up to normal levels. The chainstays are finished and attached. The chainstays need to have their top caps finished and then they can be attached. I'm just waiting for some spokes so that I can build up a rear wheel to double-check the rear alignment. Next up is the fork, which should take a day or so. After spending so much time on the lugs, I can't wait to get this thing done and on the road so that I can get moving on some new projects. Saturday night we got a pretty good snow here so I spent most of Sunday holed up in the garage and managed to get the front triangle finished. It's been a while since I've done lugs. For the first couple of them I ran into that zen "Finger pointing at the moon thing" where I was paying too much atttention to the silver rod and not enough to my heat application and I toasted a bit more flux than I would have liked. But eventually I got to the point where I was getting almost no charring at all. My hand-cut lugs, though they seemed to be at the right angles, weren't quite accurate enough so I ended up doing a little cold setting to make everything fit. Which somehow it did. Since I don't have a fancy jig I was pretty amazed to see the whole thing come together at the right lengths and angles. So now I just have to do the stays, which will be a piece of cake compared to all the filing and cutting I've done so far. Sorry I haven't posted much lately. Progress still has been slow, for good reasons and bad ones. First, I had to play with the lathe and the milling attachment. I modified some tubing blocks to fit in the milling attachments so I now have a way to miter tubes accurately. So that time was well spent. Then there was some modifications to my wet weather commuter. More on that later. Second, I got some chickens. I've been wanting some for a long time and I got a chance when a friend ended up with too many chickens. So I spent weeks researching about chickens and building a coop and chicken run. In the meantime, I've picked away at the lugs. They've been bored out so that there is no tube backing the end of the socket. I've also been doing tapering and shaping to give them more of a natural look. They're just about ready to be assembled into the front triangle. I'll take pictures of the more or less finished lugs and post them in the next few days. Then disaster happened. 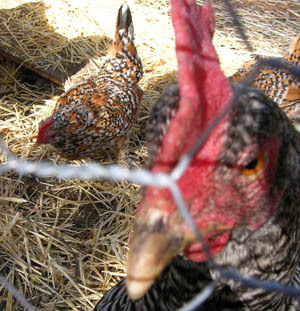 On Friday some dogs chewed through the wire fencing and got into the coop and killed all of my chickens but two. I tried to clean up and stabilize the survivors as best as I could, but one had some internal injuries and died the next day. The only survivor, Princess Layah, is recovering and looking stronger every day, but she still limps and isn't eating much. The holidays has been a time killer, then an impromtu cyclocross series materialized so I had to get a cross bike running again. 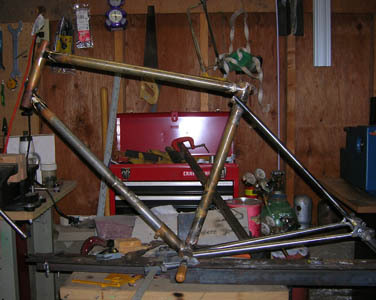 So in the meantime the frame hasn't made much progress. 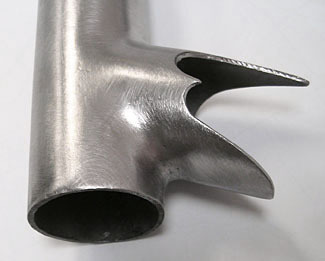 I filed down the fillet on the bottom bracket lug as shown below, and have it marked up so that I can start cutting the lug edges. HINT: Old windshield wiper blades make great fillet filing forms. Chop off a piece about 6" long and cut off the blade. Run a strip of emory paper along it. It has enough flexibility and rubbery-ness to conform to the curvature nicely. I also just got a Sturmey Archer AWC hub for this project, and have been working on the shifter details. Since the bike splits in two I don't want to run cables from the front half to the back. Originally I was just going to run a two-speed kickback hub, but then I thought about running a real three speed and mounting a shift lever on the seat tube like the Herse Demountables have. I was planning to take an indexing downtube shifter, take it apart, and flip over and modify the index plate so that it would only have one click in the middle. Then I thought of something much cooler. I'd like to shift it with a rod mounted on the seatstay, much like the shifter rods on the old Cambio Corsa derailleurs. It should be really simple, but I've spent a lot of time trying to design a system to get the correct shift spacing that maximizes elegance while still keeping it within my machining capabilities. It's been amusing because it should be 1800's-era technology - really simple right? But then when you get down to the details, it turns out to be not as simple as you'd like. Or at least if it is simple to engineer, it doesn't look right. I think I've figured out a good way to do it but I'm going to have to prototype it soon. Thanks to MC for the link! Here's the bottom bracket lug, about halfway done. The longer socket is where the downtube will slide in and be clamped. The tubing has been bored out for paint clearance for the first 2 cm of the socket, and the last 1 cm has an insert of smaller tubing brazed internally to act as a stop. Using a boring bar I squared off the end of the stop to remove any extra brass and provide a more precise location of the down tube . The socket will get a binder bolt and the front will be carved to look more elegant. 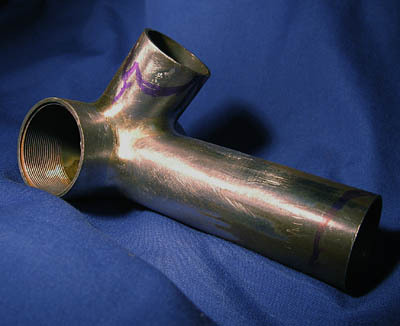 The seat tube socket will also get carved to match the other lugs. I also finished off the top seat tube lugh with brass too. I'll add some new pictures of that part soon. I haven't work with brass for almost a year - I've been mostly welding - and it was a lot of fun to lay up that fillet. I finished off the upper socket last night and took some better pictures today with a digital camera that has a macro mode (Nikon CoolPix 3100). I'll have to square up the lug edges and dial in a few spots where the curvature isn't quite right, but this piece is just about there. 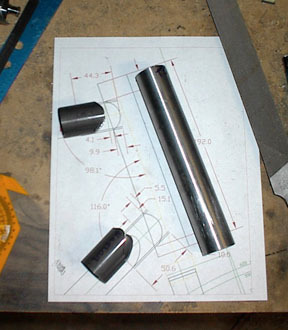 Next I'm going to work on the lower half of the seat tube lug. In the mean time I need to give some thought to whether I want to grind out the portion of the head tube that is inside of the socket. Leaving it there would give me a little more joining area for an inside fillet, but removing it makes it easier to see when the silver has flowed through, and makes the mitering really, really easy. But progress is being made and so far I'm happy with the results. After tacking the sockets, I carved them to shape with a hacksaw and lots of filing. Then I decided that since this is a prototype (a very elaborate one, admittedly) I could use different joining techniques on each joint. So I finished off the weld on the sockets using my OA torch, and then started filing. The picture below shows the bottom socket all filed. It looks really good - too bad it's not stainless! I polished it up a little bit with a Nyalox wheel so that I could get a better look at the flow and form without being distracted by sanding grain. There's a couple of spots that I need to work on a bit more. 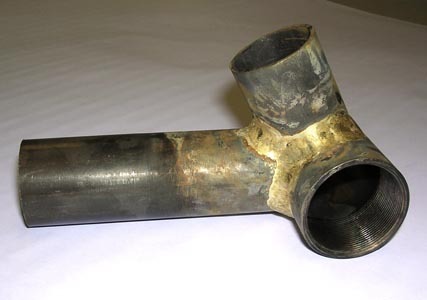 The top socket is still in its raw welded form. So there's about another 2 to 3 hours of filing left on this piece. I tacked up the head tube and sockets last night. 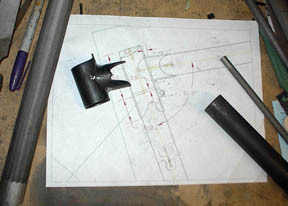 Now I'm going to transfer the pattern I carved into the seat tube lug onto the blank sockets. Then the filing begins. To transfer the pattern I'm going to wrap a post-it around the lug, cut it to match the edge, then wrap it around the blank socket and use a sharpie to mark the area that needs to be cut out. I don't need the lugs to be exact copies of each other but I'd like to at least get the proportions similar. I did some more shaping on the seat lug and it's ready to go. I also started on the head tube section. This is going to semi-lugged, with sockets for the top and down tubes only. The sockets will be filleted directly to the head tube. Aesthetically it looks cool, but it also saves me a from having to cut and file a lot of metal. Here's the tubing mitered and ready to be tacked so that I can cut and shape the sockets. 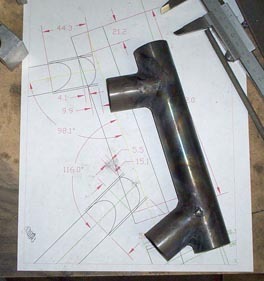 Here's the seat lug, tack welded and roughly shaped. It started out as two pieces of cromo tubing, then I mitered the front socket to fit and tack welded it in place, then I started shaping the socket with a hacksaw and files. After I took this picture I fine tuned the shape, square up the edges, and did some shaping to give it more life. 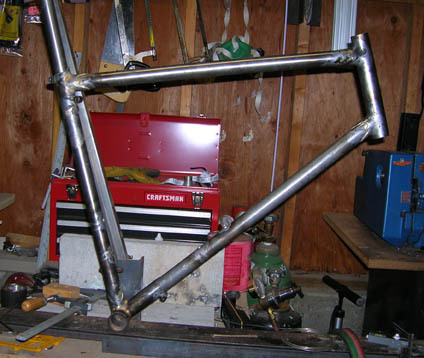 Next step will be to clean out the inside of the socket, miter the top tube, and braze them together. 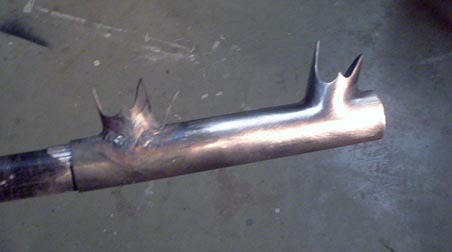 I'll be brazing the tube into the socket and building the fillet around the joint at the same time.